One of the many rewards of having our own home garden is going on a shopping spree. Not to malls but happily to garden centers, spending many hours during May to June, searching and finding some jewels to increase our tropical garden collection. Of course, bought only those within our budget, yet at the same time couldn’t help drooling over those that were overwhelmingly attractive but too expensive! Clockwise from top: Gardenia jasminoides Tabernaemontana divaricata cv. 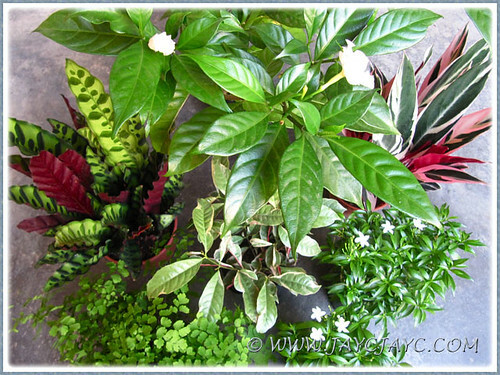 Flore Pleno (Crepe Gardenia, Crepe Jasmine), Stomanthe sanguinea ‘Tricolor’, Dwarf Tabernaemontana divaricata (Pinwheel Flower, Milk Flower), Excoecaria cochinchinensis (Chinese Croton, Blindness Tree), Adiantum tenerum (Fan Maidenhair Fern) and Calathea lancifolia (Rattlesnake Plant). Hence, during the past two months whenever possible, most evenings and some mornings to spare, have been gloriously spent in the garden! Great to dig into the garden border, hands in the dirt, weeding, repotting, transplanting and reorganizing our garden landscape to accommodate these newly added plants. Thank goodness the hazy days in Kuala Lumpur, in early June were short-lived and weren’t such a deterrent… we could still garden, donned with a face mask. Whenever new beauties are added, an equivalent number of older plants have to be thrashed or given away. Heavy maintenance plants and those that attract mealy bugs easily topped the list to be rid off. Some of the plants heavily infested with pests that were forced to breathe their last recently were Dwarf Red Powderpuff, Aglaonema cv. Legacy (a Thai hybrid) and Syngonium podophyllum, whilst doubles were given away to friends and neighbours. All work and no play makes us dull and stressful! So nothing like getting new plants every once in a while to cheer us and brighten our spirits, not to mention spruce up and add interest to our garden. Another new addition in June was the Callistemon citrinus (Crimson Bottlebrush) which I’ve transplanted from a polybag into a large dragon pot. 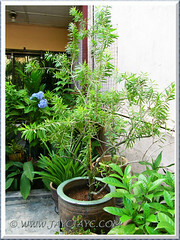 Our younger boy got this small tree from Auntie Yok nursery, near Tropicana Garden Mart for a discounted price of RM20. The tree looked over-stressed, way pass its saleable stage, otherwise would have been sold for RM50-70. Hope it’ll be back to its glorious days and flower soonest in its new home, under our care. We were attracted to this plant as it’ll produce vibrant red bottlebrush-shaped flowers intermittently throughout the year. Can’t get enough of Aphelandra squarrosa (Zebra Plant)! The previously purchased pot in March expired… RM8 gone down the drain! Added another pot in May and decided to plant it in the ground. Seemed to love its new home and thriving very well indeed. 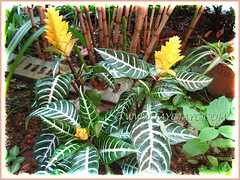 The bright yellow flowers are gorgeous and sooooo… long-lasting, not to mention its variegated foliage is so appealing. 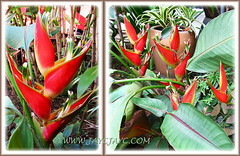 Worthy of mention is our Heliconia stricta ‘Sharonii’… another year-round bloomer that have thrived in our garden through thick and thin for more than a decade. Love the bold and dramatic colours of the inflorescences! These dwarf variety with attractive flowers make great front-line plants for garden beds. 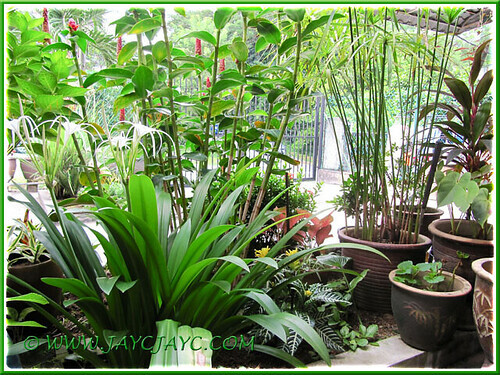 Such fuss-free and hardy plants that delight us so! 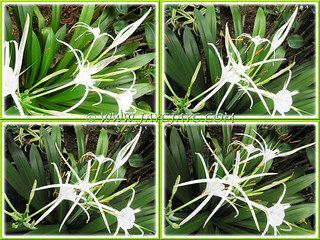 Hymenocallis caribaea (Spider/White Lily) is one of my favourite plants! Even though it’s considered so ordinary by others as they’re rampantly planted everywhere, so to speak, I find them mesmerizing! Like our human babies, we also cherish every feature of our garden babies. I simply love strolling in the garden when the Caribean Spiderlily blooms. Their scent is so heavenly in the evenings and it permeates the whole garden with its intoxicating perfume. Besides, it’s lovely to see the buds unfurled rapidly, with the petals spread out to expose the contents inside… all done within a few seconds. The image above displays the buds bursting forth in quick succession! Gardening enables me to enjoy nature at its very best – I get to see up-close the details that I choose to observe, new leaves sprouting, buds unfurling, flowers at their best or past their glory and setting seeds/seedpods, etc. 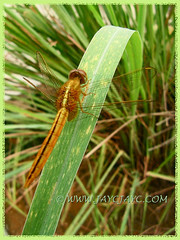 An added bonus too when other visitors fly into our garden to enjoy whatever attract them. A wonderful chain reaction! Seems as if the grateful plants are saying to us, “You help me, I help you!”… attracting butterflies, birds, bees, dragonflies and the likes, for our joy and pleasure. God’s creation is absolutely awesome! 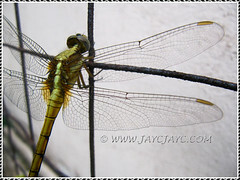 Would appreciate very much if someone could help ID these three visitors two dragonfiles for us. We’re so blessed to be able to continue gardening in our golden years and enjoy nature that abounds in our garden. What a wonderful and contented life! Hope you’ve enjoyed viewing our garden as much as we love sharing the treasures therein. Oh I haven’t seen an update from you for a while. 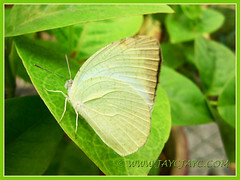 Your garden is looking so lovely and healthy – you certainly have been busy. 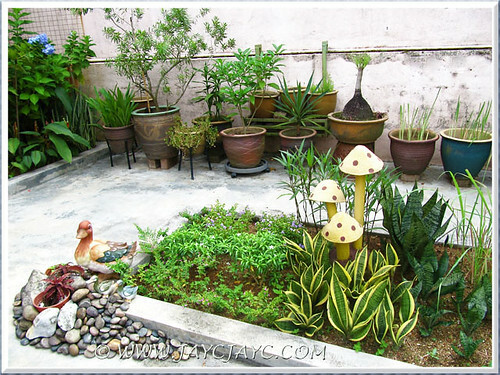 I love those mushrooms in the front bed. That zebra plant is spectacular – I will have to look out for one. I hope you are both well. Blessings. 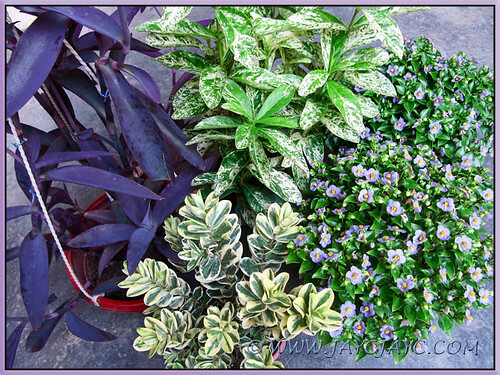 Beautiful plants, welcome .. in the second picture the green leaves variegated plant can be a Prunus laurocerasus “marbled white”, and the bottom looks like a variegated Hebe andersonii. Yara : Thank you so much! Really appreciate you prompting the ID of the two plants. Will google further to confirm before editing my article above. You’ve truly made my day with the disclosure… thanks again and God bless. …I’m always at peace in my garden. I know that’s how you feel also. Your enthusiasm is very catching. Hope to read more of your updates. God bless you and family. Thanks for showing your plants. Blessings and hugs. Juliet : Welcome!! 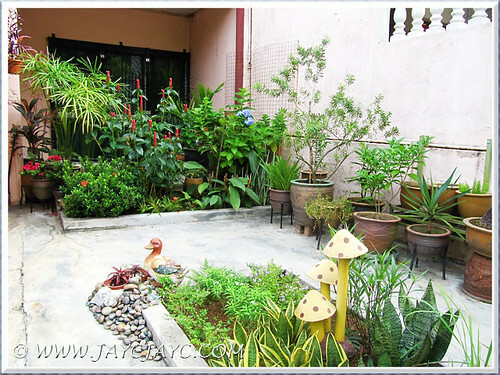 You’re absolutely right… peaceful, serene and totally absorb when in the garden. Thank you so much for your kind thoughts and blessings. Looking forward to seeing you again. Happy gardening and God’s blessings. Yara : The pleasure is all ours to share! 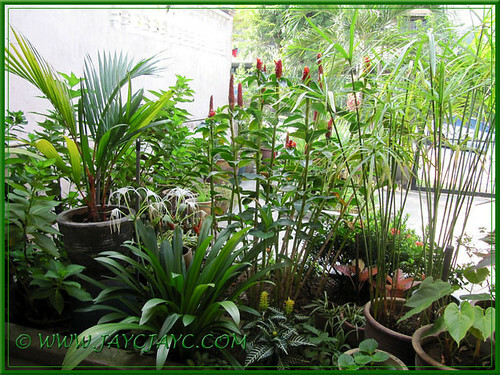 Thanks again for plants’ ID, truly appreciate your help… I’ve just included the info into my article. Have a wonderful weekend. Hugs and God bless. Those are truly lovely plants you purchased these recent months. I’m actually more like a plant hoarder myself and find that practically there is no possible space and miraculously find that I can manage to cramp up something somewhere along the way. Good to know that you are back on your feet in gardening after a long rest. Lovely to hear from you again, James! Thanks a lot for your kind and much appreciated thoughts… you’re such a sincere friend. When we were younger and stronger then, like you we too had packed our small garden tightly, with whatever lovelies that attracted us. Gone are those glorious days… now, we just have to be contented and happy with whatever we can manage. Thank goodness we can access our photo archives to reminisce our past gardening pleasures, as well as enjoy online beautiful virtual gardens tended by other passionate gardeners, like yours! Sorry for the late response, James… we were away on a local pilgrimage tour (5days/4nights) and just returned home late last night.